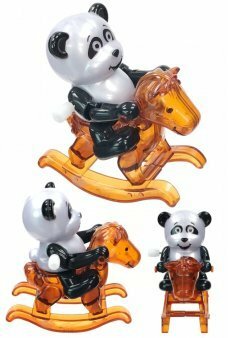 Tomy of Japan makes the most wonderful and original wind ups. 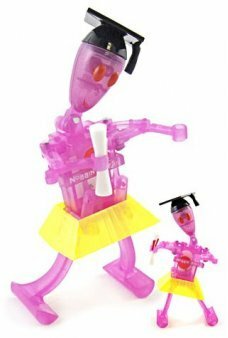 Classic Windup Toys from Tomy with New Functions from ZWindUps and California Creations. Our acrobatic Gorilla leans down over his banana and then does a back flip over and over again. Gregory has a translucen..
Neutron Robot walks forward while rotating his clawed arms in opposite directions. 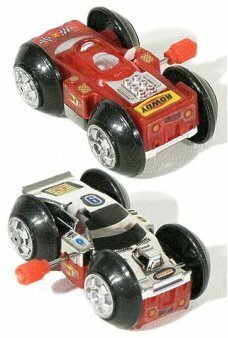 Wind up our detailed Neutron and he q..
Rowdy the Racecar drives forward and then suddenly flips on its side and goes in the opposite direction. This unique Rac..
Our Gracie has graduated, It’s time to dance! Graduate Gracie holds her Diploma, swings her classic black mortarboard ac..
Our cute Cluck the Chick flaps her wings, while she hops and pecks. 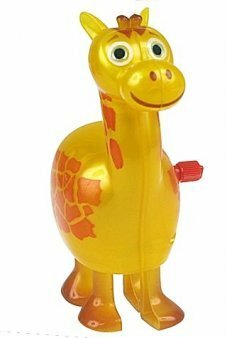 This little chick has a translucent yellow plastic b..
Wiggling Wet Fun! 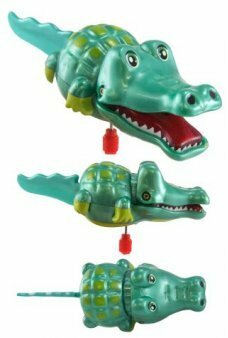 Wind up our cute Otto the alligator and watch his tail move and his jaw snaps as he moves through wate..
Our happy Ladybug Lori nods her head back and forth while she walks on her 6 shiny green feet. Our adorable Ladybug has ..
Our cute Winky the Frog hops on his webbed feet and ten suddenly stops to slowly blink his red eyelids. 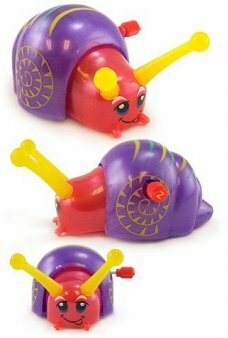 Then he does it ..
Our colorful Snail wiggles his tail and head while he quickly crawls along. 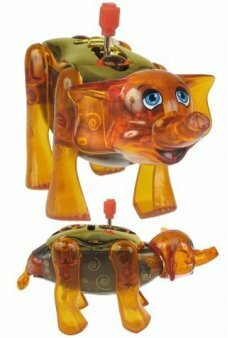 Surprisingly Snoozy the snail is not at all ..
Our cute Emma windup is the clever combination of a robot and an Aftican Elephant! Just wind up our adorable Eleph..
Our cute T-Rex Tammy walks, moves her arms, and opens her mighty jaws! New for 2011! 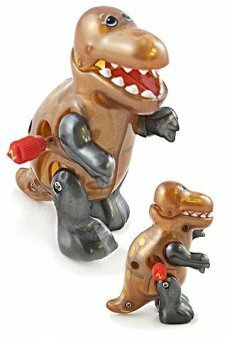 Just wind up our tyrannosaurus and ..
Seymour the Shark swim through water with his rear propeller while he blinks his cute eyes. He swims and teases in the ..
Our cute Froggy swims by kicking his long legs and wiggling his arms. Our 2010 happy Froggy is a shiny and translucent g..
Gigi the Goldfish flips her tail tail fin to swim with realistic motion. Gigi the Pink Princess has a unique tail motion.. Dusty the Dune Buggy drives forward and then does an amazing forward roll. This unique Dune Buggy wind up features a Kan.. 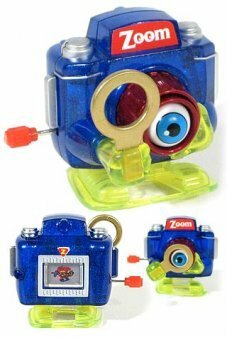 The famous and amazing Zoom wind up toy is back! 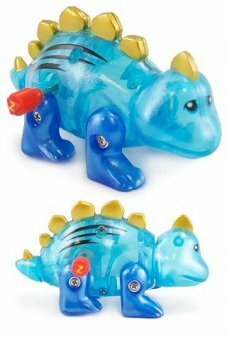 Zoom walks forward and lifts his magnifying glass while he roles his bi..
Our clear blue Stegosaurus Stan actually walks! Just wind up our classic dino and she will walk on four feet, wiggling ..
Our cute and clever Raffi the mouse rides in his red walking shoes. Raffi rises and looks both ways as his shoes step f..
Our Radical Dune Buggy drives forward, does an amazing sideways roll and then darts away in another direction. 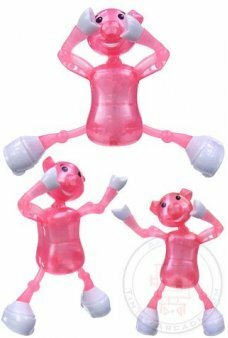 This uniq..
Our adorable pink piggy, Pauly is an amazing, acrobatic dancer! 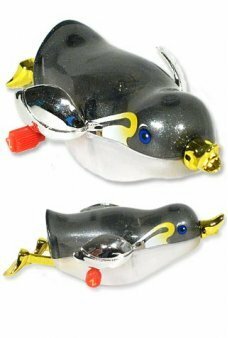 Wind up Pauly and he nods his head and arms from side to..
Our cute Saucy the Swimming Seal flips her shiny silver fins performing random somersault tricks. 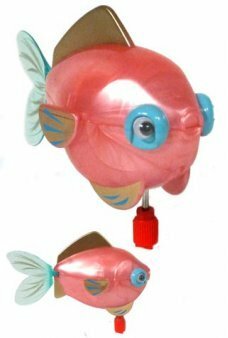 This pink translucent..
Wind up our cute Priscilla the Penguin and watch her shiny gold webbed feet kick and her silver wings wiggle as she move..
Wind up our happy Topaz the Turtle and watch him kick his bronze webbed feet kick and arms as he moves through water. Ou..
Our happy Wilbur Whale features blinking eyes, a flapping tail and a real water squirting blow hole! Just wind up our ad.. The famous and amazing Peepers wind up toy is back! Peepers walks forward and lifts his glasses while he roles his big ..